to raise awareness and take action for protecting and preserving the diversity and uniqueness of the urban fabric in New York City. As our vibrant streetscapes and neighborhoods are turned into bland, suburban-style shopping malls, filled with chain stores and glossy luxury retail, #SaveNYC is fighting for small businesses and cultural institutions. Our mission is to bring attention to the plight of Mom and Pop, raise awareness of the issues, and encourage state and city government to implement protections for small businesses and cultural institutions across the five boroughs of New York City. How can we save New York? Today, more than ever, the soul of New York City is getting murdered by rising rents, suburbanization, rampant development, and a flood of chain businesses. Hyper-gentrification is destroying the cultural fabric of the city. Meanwhile, tax breaks and other incentives are given away as welfare for powerful and wealthy developers and landlords. There is no such thing as the “free market.” The city is created by policies–and policies can be changed. 1. Pass the Small Business Jobs Survival Act (SBJSA) to create fair negotiations of commercial lease renewals, so landlords can’t use insane rent hikes to evict dependable and valued business people. 2. Pass a commercial vacancy tax on landlords who leave spaces empty, creating “high-rent blight” and blocking out small businesspeople while they build equity on emptiness, write off the losses, and wait for sky-high rents from chains, banks, or luxury businesses. In 2018, Mayor de Blasio told WNYC he is interested in the commercial vacancy tax. The idea was inspired by leaders in London. As an incentive to keep shops in use, and rents down, tax relief was taken away from businesses that keep properties empty for longer than 6 months. A vacancy tax would be more of a disincentive. Just how bad is high-rent blight? 3. Control the spread of chain businesses. City Hall should follow the example of San Francisco, where the city controls “formula retail.” If Giuliani could keep adult businesses from operating near one another, then de Blasio can keep national chains from doing the same. A few chains are not a problem, but New York is being strangled by them. They drive up rents, contributing to the eviction of small businesses, as they destroy the unique character of the urban landscape, turning the city into Anywhere, USA. See what San Francisco is doing here. Read more about protecting cities from chain stores here. 4. Start a Cultural Landmarks program. While general commercial rent control may be far in the future, we can protect what little remains of the city’s oldest and most beloved small businesses by creating a selective rent control program. Rent control can be gifted to businesses that qualify for Cultural Landmarking. Funds can be channeled to support these businesses and help keep them alive. Local communities can nominate the businesses they want to protect. See SF Heritage for how they’re doing it in San Francisco. Barcelona is doing it too. 5. Take the million-dollar tax breaks away from Big Business and give them to Mom and Pop. Businesses that own their buildings are not safe either. They struggle with sky-high water bills and a Kafkaesque Department of Health. They often don’t know how to market themselves in the new age of social media, and they’re being bled alive by encroaching chains. Give them tax breaks, along with lower fees for violations and help with creative marketing. 6. Bring back commercial rent regulation. This might be a tough sell, but it’s not impossible. New York City enjoyed this powerful protection from 1945 – 1963. We can have it again–if New Yorkers demand it. It is time to take action and to demand action from our city government. Save New York! Join the Save New York Facebook page to start organizing with other New Yorkers today. 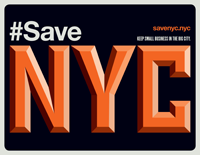 Use the hashtag #‎SaveNYC when you tweet. Find us here on Instagram. There aren't any events right now. Please check back soon!